Mullen Test vs. ECT: which rating should you use when selecting material for your corrugated boxes? 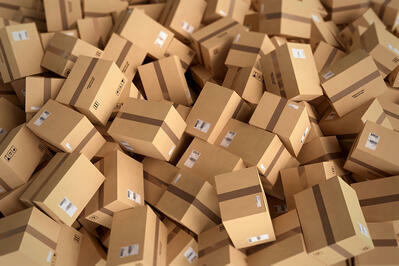 Corrugated shipping cartons are subjected to a lot of different kinds of strain during packing, shipping and storage. We put heavy contents in them and then stack cartons on top of each other. During shipping, they may be at the bottom of a heavy pallet or stacked among boxes of different weights and sizes on a delivery truck. They may be thrown about or subject to sudden forces that can puncture or rupture their sides. How much will the contents weigh? What is the maximum weight that may be stacked on top of your box during bundling, palletizing or warehousing? What other forces may your box be subjected to during shipping and handling? There are two common methods for measuring corrugated material strength in the carton industry: the Burst (Mullen) Test, and the Edge Crush Test (ECT). Let's take a closer look at how each test is done, how they compare and how to understand ratings from each type of test. The Burst (or Mullen) Test has long been considered an industry standard. It measures the force required to burst or rupture the face of a corrugated board. The Mullen Test suspends a piece of corrugated material and uses a machine to apply increasing levels of force to the face of the material until it bursts. Burst Test results are given in pounds per square inch. A Mullen-tested box rated at 200# can withstand 200 pounds per square inch of force applied directly to the linerboard on the face of the carton. 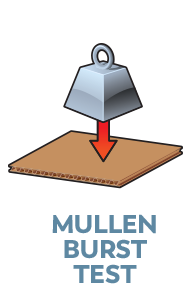 Mullen Burst Test standards dictate a minimum board weight for the corrugated material. In other words, every square foot of the final corrugated material must contain at least the minimum amount of base paper material required by the standard for its Burst Test rating. For example, a single-wall corrugated cardboard box with a 275# Mullen Test rating must contain at least 175 pounds of base paper per 1,000 square feet of corrugated material. The Mullen Burst Test is geared towards measuring the forces a carton may be subjected to during rough handling as well as the amount of weight the box can hold. It does not measure how much weight can be stacked on top of the carton. To understand stacking strength, you need to look at Edge Crush Test (ECT) ratings. 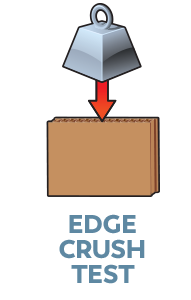 The Edge Crush Test, or ECT, is a newer test developed to look specifically at how much force a corrugated material can withstand on its edges without crushing. Instead of applying force to the face of the corrugated material, as the Mullen Burst Test does, ECT applies force to the edge. The material is compressed top to bottom until it buckles. Edge Crush Testing measures the force applied in pounds per linear inch of load-bearing edge and is reported as an ECT rating. 32 ECT is the most commonly used corrugated material. ECT has grown in popularity since its invention in the 1990s because it provides a better measure of how well boxes will hold up to stacking and palletizing. Modern shipping and warehousing methods mean that most products are now shipped and stored in pallets, where boxes may be stacked several layers deep. So the box not only must be strong enough to hold the weight of the product within, but also have edges strong enough to hold all of the weight on top without crushing or deforming. Unlike Mullen Test ratings, ECT ratings do not require a minimum amount of base paper in the corrugated material. This means that ECT-rated boxes are generally lighter and use less material than a Mullen-Tested box that is considered to be equivalent. This can help companies reduce shipping costs and improve environmental metrics. Which Rating Should I Use: Burst Test or ECT? While there are charts that show conversions between Mullen Test and ECT ratings, it is important to remember that the tests are not equivalent. They measure completely different things. If you are stacking and palletizing your cartons, ECT provides a better measure of how well they will hold up in a stack. If you are shipping individual boxes and are concerned about rough handling conditions, you may be better off with Mullen-tested cartons. These tend to provide better protection against damage from external forces (such as dropping, kicking or punctures) than boxes with an equivalent ECT rating. A box with a Mullen Test rating of 200# is equivalent to 32 ECT in terms of stacking strength, but will have a bursting strength about 60% greater than the ECT box. This will not matter if your primary concern is stacking and palletizing, but can make a big difference if your box is handled roughly during delivery. Need help deciding which type of corrugated shipping carton is right for you? Pantero carries a broad range of box sizes, weights and styles, including both ECT and Mullen Test rated boxes. We can help you choose the right box for your products!